Cherry- Almond Cookie Dough and Whipped Cream Cheese… need I say more? These are so decadent. 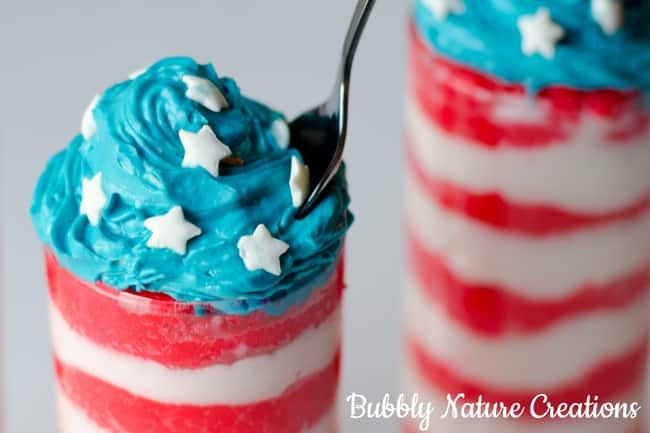 Perfect for a formal 4th of July or served up casually… they can go with any Patriotic event! Hubby thinks they look like “fire-crackers”! So cute! These mini sized portions are just right… this dessert is RICH! Aren’t they sweet? We loved them!!! 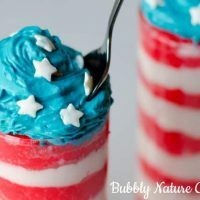 Cookie dough is all the rage and these cookie dough filled mini parfaits are perfect for 4th of July or any Americana holiday! For the cookie dough. Cream together sugar, butter, Cherry Flavoring, Almond Extract, and Marshmallow Fluff. Add flour in slowly. Mix in red food coloring until desired color. Chill until ready to assemble Parfaits. Beat room temperature Cream Cheese on high for a few minutes until light and airy. Add in the heavy whipping cream, vanilla and powdered sugar. Beat on high until stiff peaks form. Some cream cheese may still be lumpy- this is ok. Take out 1 cup of the mixture and mix blue food coloring into it. Layer the cookie dough with the whipped cream cheese in 1/4 inch layers in mini parfait cups. Use piping bag to fill the whipped cream cheese in. Top with a dollop or piped later of the blue whipped cream cheese. Sprinkle with the white sprinkle stars. Now enjoy! Those look amazing Rachel! I love all of the Fourth of July posts that people have been doing recently! Wow….these look delicious! Donny is right, they do look like fire crackers minus the fuse! Yumm! These look so yummy! I’m think I might have to make them!!! That is cookie dough? Oh me gee that’s awesome! wow, these look fabulous and delicious! Oh my….these are absoutely adorable. 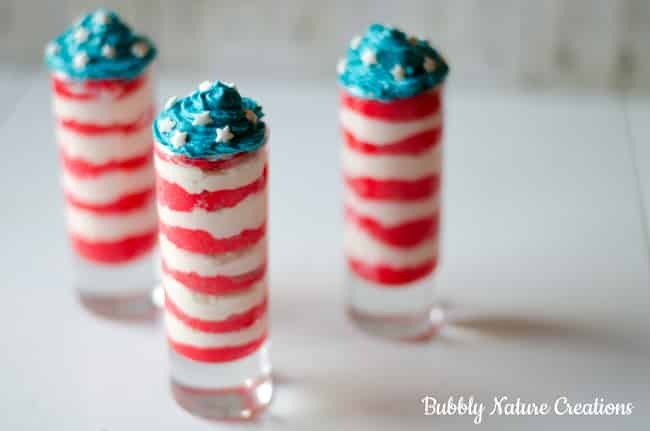 I have been looking for some fourth of July ideas and these are perfect ! These look absoutely wonderful. 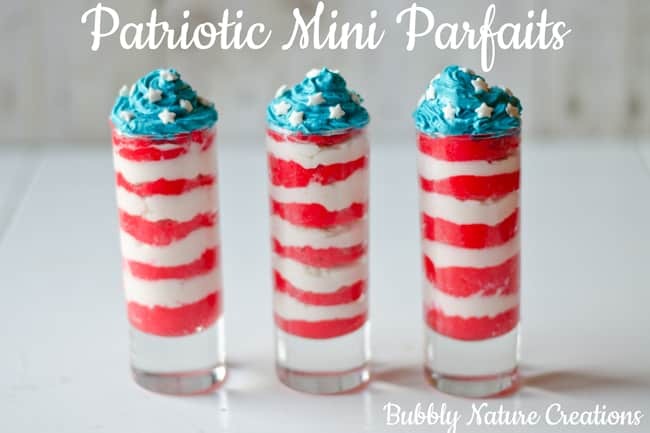 I havee been looking for some fourth of July ideas and these are perfect !